Domenico Veneziano (c. 1410 – 1461) was an Italian painter of the early Renaissance, active mostly in Perugia and Tuscany. Little is known of his birth, though he is thought to have been born in Venice, hence his last name. He then moved to Florence in 1422-23 as a boy, to become a pupil of Gentile da Fabriano. 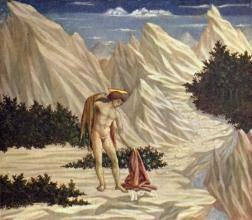 He is said to have worked with Pisanello in Rome around 1423-1430. 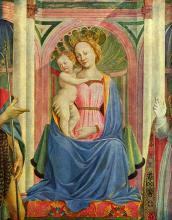 One can see the influence of Benozzo Gozzoli in his work. Documents place him in 1438, painting frescoes for the palazzo Baglioni in Perugia, and he wrote to Piero de' Medici seeking patronage. Between 1439 and 1441 he painted his masterpiece of the Adoration of the Magi. 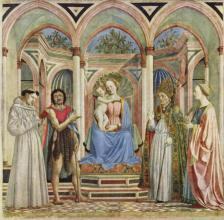 Veneziano's work is noted for both his use of colour and perspective. His masterpiece is considered to be the St. Lucy Altarpiece (1445), which was originally in the Santa Lucia dei Magnoli in Florence but has been moved to the Uffizi. The painting, tempera on panel, displays such an unusual palate for this period that Vasari wrote that it had been painted in oil. Although there is little surviving work by Veneziano he is also known for a round panel of the Adoration of the Magi (1439-1441) which was probably commissioned for the palace of the wealthy Medici family and is now in Berlin. He influenced Andrea Mantegna.